I have always had an interest in Panoramic Photography and which fits nicely with my overall interest in Landscape Photography, but to do Panoramic Photography correctly you need a bracket that allows you to position the camera so it rotates in the middle of the lens not on the standard tripod socket. This centre lens rotation is known as the 'Nodal Point' and if positioned correctly reduces Parallax Error which occurs when rotating across the sweep of a Panorama, this in turn allows for better stitching and less cropping of the final image. Another reason for the special bracket is to allow the sections to be captured vertically rather than horizontally, the latter giving you long thin images. 1. An s/h 'Metz Flash Bracket' £10. 2. Some 'Video Lighting Brackets' from a skip - £0. The Metz bracket needed a bit of sawing, drilling & filing, whilst the video light brackets just needed reconfiguring, drilling and new bolts adding etc, the end result can be seen above. Having assembled the bracket and tested the camera to fit etc, the next job was to re-spray with hammerite and a blowtorch ... sounds insane but is perfectly safe practice if you’re careful. The benefit of using a blowtorch is that it does give a great finish when using cans of spray-paint, just allow the vapours to go after spraying before hitting it with the blowtorch and sweep over the painted surface, don’t hold the flame on the painted area too long. Still here and in one piece after my blowtorch hammerite spraying session last night and the bracket is looking good, cost so far £10. The use of the blowtorch was essential working in the garage last night with no heating, I did consider putting the sprayed bracket in the oven on 100 deg but after careful consideration decided that the plastic parts might melt (unless I removed them) and the Missus would not be too happy either. The next phase will be to test the bracket to check I have centred the lens correctly; there is a test on the web using two marker pens that appears to work. I am also considering ways of adding sliders to the sides of the top section to ensure the crossover remains at 90 degrees. 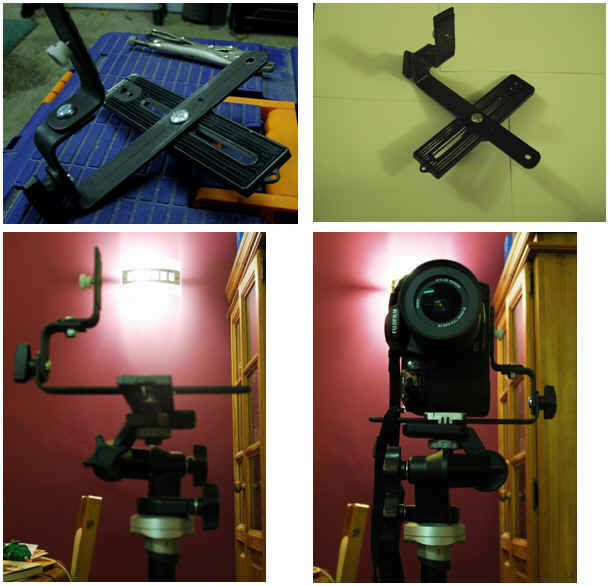 Last phase will be to get outdoors with camera and test the bracket out properly.